Like most applications, E-Studio features a variety of menus. The menu bar is located at the top of the application window. Menus are lists of related commands. For instance, an Edit menu typically contains commands allowing the user to Cut, Copy and Paste items; commands performing similar duties are grouped together within the same menu. Commands are selected by clicking on them with the mouse. Alternatively, accelerator and short-cut keys are provided. These short-cuts, sometimes referred to as “Hot keys”, are key combinations typically including the Ctrl, Shift, or Alt keys pressed simultaneously with another key. They activate the corresponding command as if selected from a menu. It is not necessary to open a menu to activate the hot key selection method. 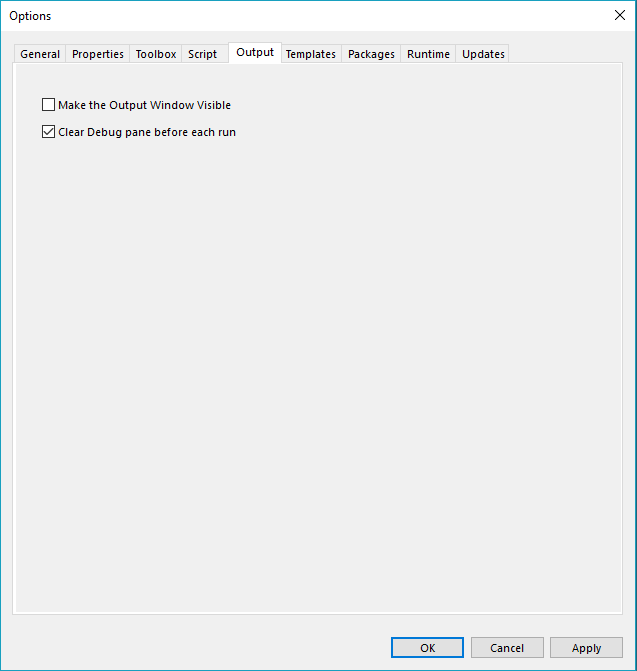 An ellipse (…) following a command in a menu signifies that a dialog box will open when that command is selected. The dialog box contains the necessary option information for completing that command. Some menu commands contain sub-menus. The sub-menus function just like regular menus (i.e., commands are selected by clicking on them with the mouse). Shortcut menus are also available for many objects. Also called context menus, they are a collection of related commands pertaining to a specific object. Access these menus by right clicking an object. 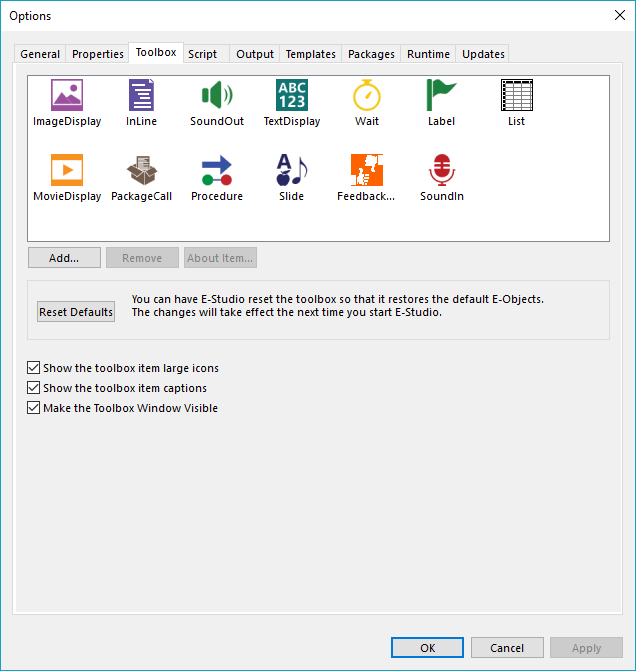 New… Ctrl+N Creates a new E-Studio Experiment File. Open… Ctrl+O Displays a dialog box to open an existing *.ES file. Save Ctrl+S Saves the current *.ES file. Save As… F12 Displays a dialog box to save the current *.ES file under a new name. Exit Alt+F4 Exits the application. Undo Ctrl+Z Reverses the last action performed (when possible). Redo Ctrl+Y Repeats the last action performed (when possible). Cut Ctrl+X Removes the selected text and places it on the clipboard. Copy Ctrl+C Places a copy of the selected text on the clipboard. Paste Ctrl+V Inserts the contents of the clipboard in the current location of the cursor. Rename Allows the selected object to be renamed. This alters the Name property of the object. Delete DEL Deletes the object from its selected location. Experiment… Ctrl+E Opens the Property pages for the Experiment object. Properties… Alt+Enter Permits the setting of properties for the Structure window. Find Ctrl+F Finds a designated property in E-Studio. Replace Ctrl+H Replaces a designated property in E-Studio. Mark Ctrl+M Booksmarks a designated portion of script. Clear Marks Ctrl+Shift+M Clears all bookmarks. The View menu contains a list of various windows, which can be viewed within E-Studio. The list is comprised of toggle options, indicating whether or not a specific window is displayed. When a window is currently in view, a checkmark appears to the left within the View menu. Experiment Explorer Alt+1 Reveals a window that display the Structure, Browser, and Attributes tabs. Properties Alt+2 Reveals a window displaying the property settings for the currently selected object. Output Alt+3 Reveals a window displaying details of the status of performed operations. 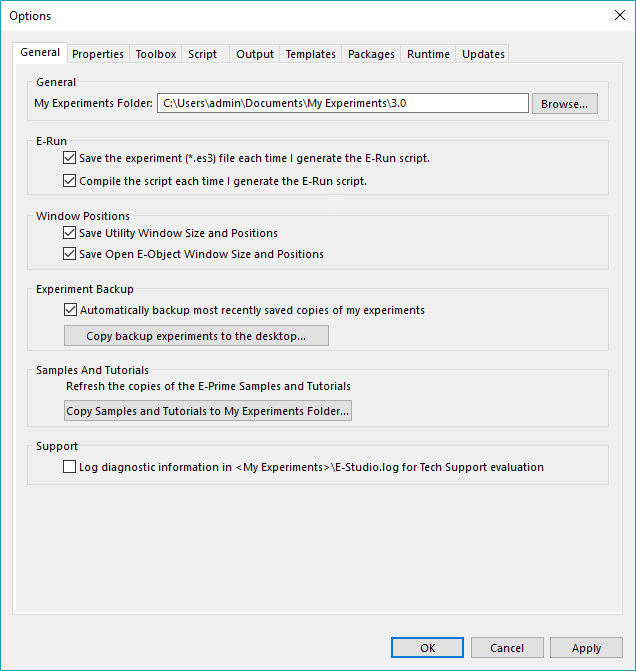 Advisor Alt+4 Reveals a windows that displays Experiment Advisor information. Toolbox Alt+5 Reveals the toolbar containing the E-Objects available for experiment creation. Full Script Alt+6 Opens a window in the application area the complete script generated by E-Studio. 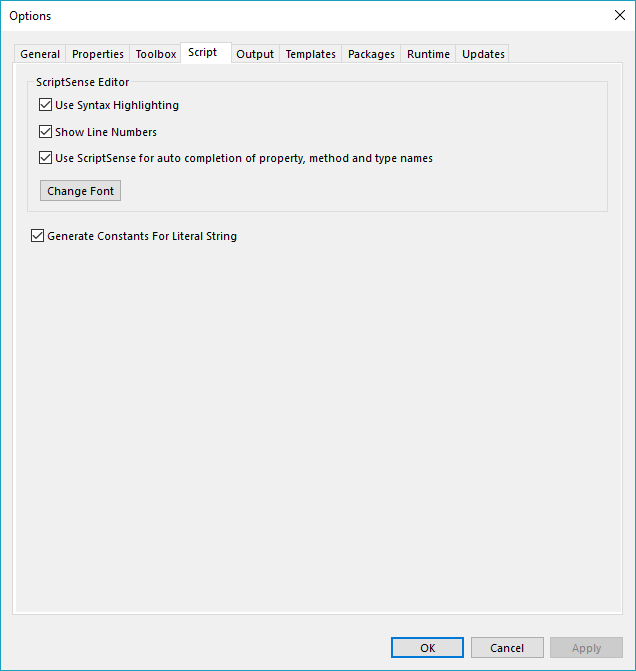 User Script Alt+7 Opens a window in the application area containing user written script. Full Screen Displays the Workspace as full screen. Toolbar Reveals the toolbar at the top of the application window just below the menus. Status Bar Reveals the Status bar along the bottom of the application window. Generate Ctrl+F7 Generates the E-Basic script based on the current settings in E-Studio. By default, the experiment is saved and compiled each time the script is generated. These options may be changed through the Options command in the Tools menu. Run F7 Generates, compiles, and executes the script. Test Ctrl+Shift+F7 Opens the E-Run Test dialog box. QuickStart Ctrl+Q Sets a QuickStart at a designated list and opens the E-Run Test dialog box. Windowed Mode Ctrl+W Specifies that E-Run Test should be run in Windowed Mode and opens the E-Run Test dialog box. E-Run Launches the E-Run application. E-DataAid Launches the E-DataAid application. E-Merge Launches the E-Merge application. E-Recovery Launches the E-Recovery application. Codec Config Launches the Codec Config application. 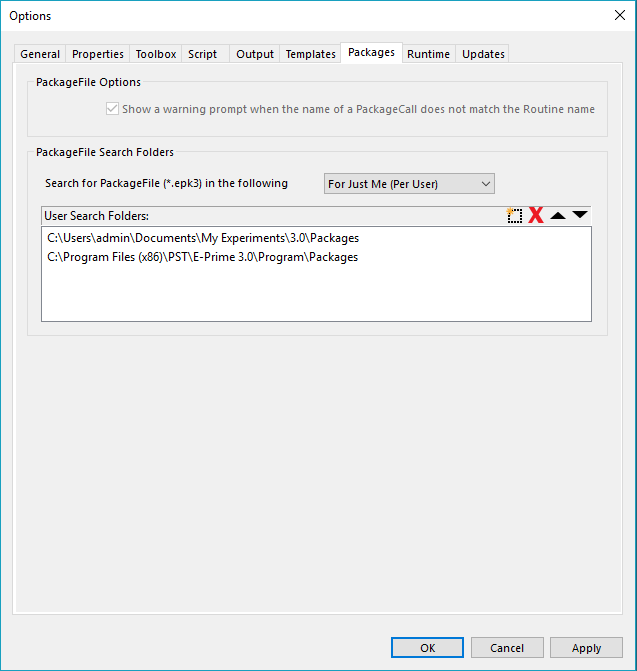 PackageFile Editor Launches the PackageFile Editor application. StartupInfo Editor Launches the StartupInfo Editor application. SoundTester Launches the SoundTester application. Windows Device Manager Launches the Windows Device Manager for the computer. Sound Control Panel Launches the Sound settings for the computer. Joystick Control Panel Launches the Game Controllers settings for the computer. Reset Utility Windows Resets utility windows sizes and positions to the defaults. Options… Specify the global options for the E-Studio application. The General tab allows the setting of the initial path for the opening of documents. This tab also sets specific properties for E-Run in regards to compiling and generating script, and the window positions in E-Studio. 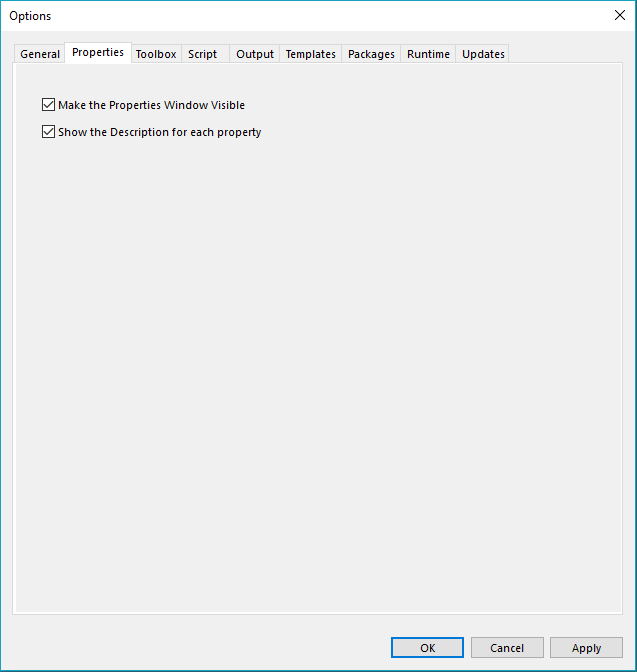 The Properties tab allows Users to change the visibility of the Properties windows. Also, descriptions of properties can be toggled on or off. The Toolbox tab allows the user to set specific properties regarding the Toolbox. By default, all currently active E-Objects are listed. The Output tab allows the user to set the visibility of the Output window, and to control whether the Debug pane is cleared after each run. 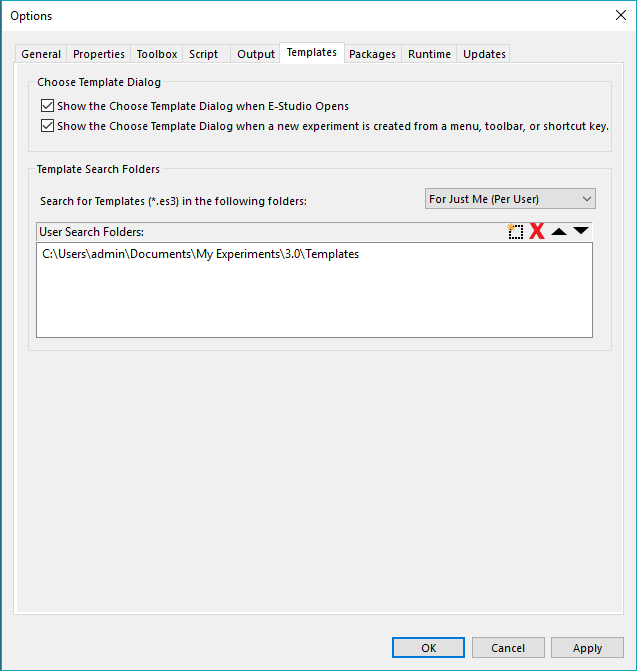 The Template tab allows the user to set options on Templates shown to the User at open. The default location for templates can also be changed. The Packages tab allows the user to set options on Packages such as default location. 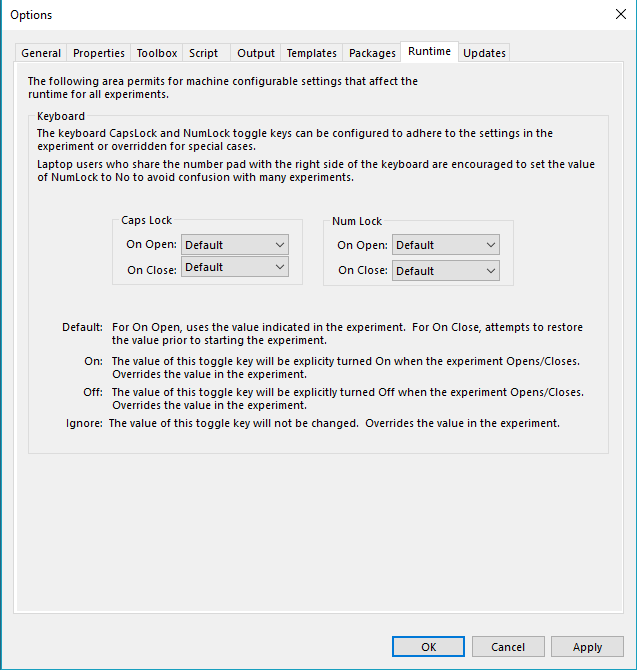 The Runtime tab allows the User to configure keys used during experiments. 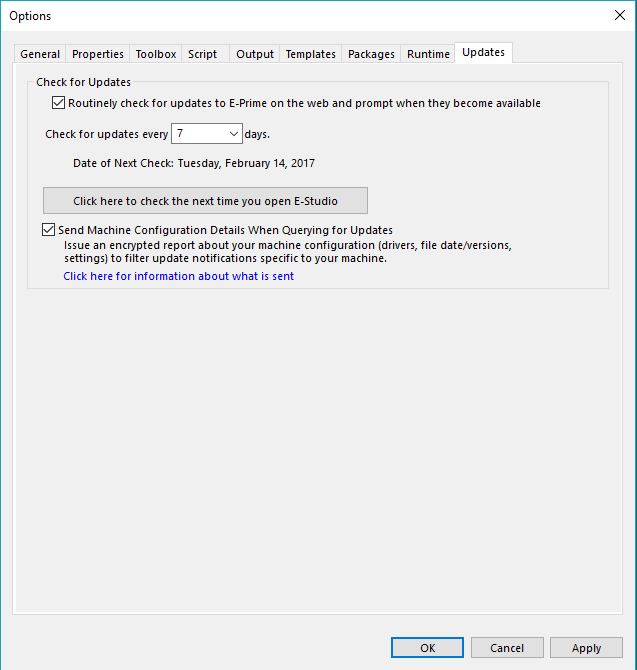 The Updates tab allows the User to configure when updates are checked by E-Prime and how often they are checked. Cascade Arranges windows open in the Workspace overlapping in a cascade formation. Tile Horizontally Arranges windows open in the Workspace in rows. Tile Vertically Arranges windows open in the Workspace in columns. Close All Closes all windows open in the Workspace. E-Prime Command Reference Opens the help for the E-Basic scripting language. Welcome to E-Prime… Launches the Welcome to E-Prime 3.0 website. Online Resources… Launches Online Resources for E-Prime 3.0 including the Knowledge Base and documentation. User Forum… Launches the E-Prime User Forum. Register Product… Provides the ability to register the E-Prime product with the PST Support site. Technical Support… Launches the PST Product Service and Support website. E-Prime Timing… Launches the PST webpage that contains information on E-Prime timing. About E-Studio… Opens a dialog box revealing the application information, including version number and serial number. 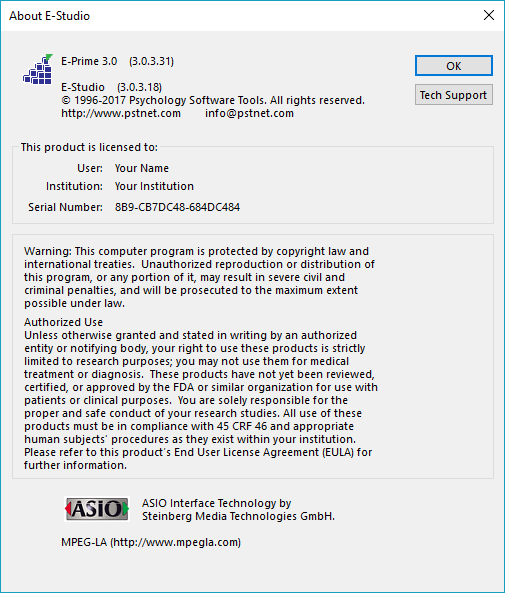 When contacting PST for technical support, the user must provide a valid serial number, which can be found here in the About E-Studio dialog box. In addition to providing the user with the application and product licensing information, the About E-Studio dialog box also includes a helpful tool used by PST technical consultants to collect information regarding the user’s machine and E-Prime. Clicking the Tech Support button displays the PST Tech Support dialog, listing the available options to help diagnose problems that may occur within the system. This will help to determine causes of problems in relation to the machine and version of E-Prime. 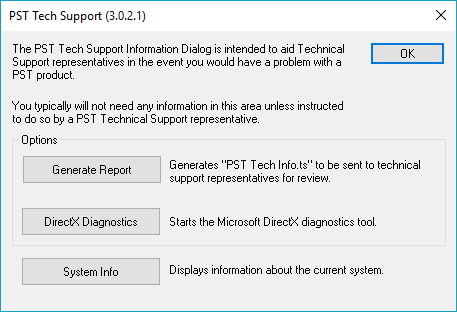 The PST Tech Support dialog box will appear which includes two options; Generate a Report or run DirectX Diagnostics. A PST Technical Support representative will instruct which option to choose in order to help remedy a problem that may be occurring. As noted in the dialog box, users need only select from the following options if instructed to do so by a PST Technical Support representative.